Down to Earth NGO in Mumbai: Part 1 On this day, I woke up to another day of pouring rain. It was the monsoon in Mumbai, which consisted of rain like I have never seen before in my life. I’m from LA and I always tell folks the story of how at one of my internships I called to say I’m not coming to work because of the rain and it was totally fine. This is an example of how ridiculous LA people can be when it comes to rain. I decided against taking the metro and used my other way of getting around, which is Uber. I was scheduled to visit Down to Earth, an NGO that is essentially an after/before school program that focuses on Holistic Education, English, Math, Sport, Performing Arts as well as Art and Craft. 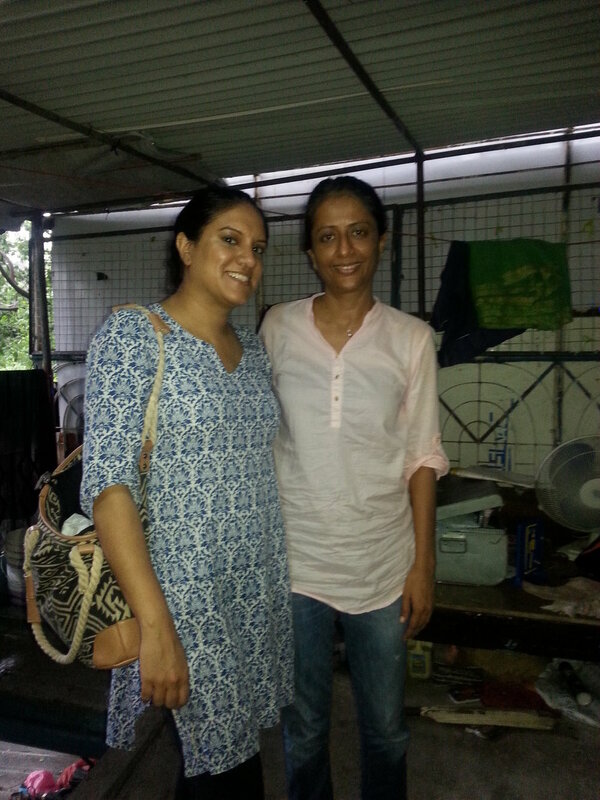 I had learned about the organization through my dear friends Dev and Ankita. My first visit was actually with Ankita. She was covering a story on alternative education in Mumbai. Dev is one of the Founders of the organization. I waited for Kirthna, the incredible inspiring dedicated volunteer teacher, who has been with the organization for years. We walked through the numerous dark narrow walkways filled with water, which came up to my knees to reach. As we walked, two of the students joined us. Kirthna also mentioned to watch out for rats and loose electrical wires. At this point, I thought maybe I shouldn’t have come. Kirthna had advised me not to come now because of the monsoons but since I was leaving soon, this was really the only day I could come. Other issues included water logging. Water is trapped and because of sewage, diseases and other problems are created. We passed small cramped homes where you could see water had already entered. People were continuing to do their everyday tasks despite the challenges. Kids were on their way to school, women preparing breakfast etc. We were probably passing by some of the homes of the children I would be soon meeting. Ambedkar Nagar, is a slum along the sea-front. This slum is close to Colaba, where the Taj Hotel and Gateway of India is. Similar to other slums, many of the folks who live there work as: rag pickers, drivers, domestic help, gardeners, vegetable vendors, but here many also work on or near the docks and do work related to fishing. Later, Kirthna told me that if the “parents don’t go to work, the kids will go hungry that day”. This statement has stayed with me. How can a parent think about education, when they are focusing on whether they can feed their child? After 5-10 minute walk we arrived at one of the students homes. Down to Earth is located above Harsha's home. Reaching the program involved a bit more adventure, which included climbing up two ladders. We reached and the kids slowly start to come in. A few of them remember me from my last visit with Ankita. We started by having the kids introduce themselves including details such as name, and what they want to be when they grow up. The kids also for fun shared parts of a play they did which had panchatantra stories. The stories are fables involving animals and include lessons on morals. I was given a glimpse of a story involving a husband and wife that had marital problems and a kid who played a monkey eating lots of bananas. The scene was the husband meeting the monkey and telling him not to let his wife know he was there, the kid playing the monkey was so entertaining and played the part of a monkey quite well, which included eating bananas and making monkey noises and doing monkey movements. Eventually I shared the story of the tortoise and the hare. It was really nice to see the kids engaged in the story, After, we went around in a circle and discussed the moral of the story. Kirthna was of course helping me the entire time. The kids discussed the importance of taking time to do hard work and thought of examples in their own lives. Another child named Raju discussed how the tortoise and the hare could have worked together to win the rice. After this the kids shared some short presentations they had been working on which was very impressive. Raju presented on the Mumbai High Court. Harsha gave a breakdown on the United Nations. Out of all the NGO’s I visited, the level of confidence and English skills these kids had was indeed impressive. After the session, Kirthna advised that I get cleaned up and wash my feet and sandals. I took a short auto ride to the Taj Hotel and entered easily using my English, regardless of my simple dress. I went into the restroom available for visitors and cleaned up. Here I began thinking of the disparity and my privilege, and Kirthna saying “if the parents don’t go to work, the kids will go hungry that day”.